Jesse Ventura: We learned a lot, and it’s hard to pick out one thing. I think probably the one that got me the most was that the CIA has an assassination manual. Now, assassination is just a fancy way of saying, first degree murder and I find it unbelievable that my government would print a manual on how to do it, how to get away with it. As far as I know, and correct me if I’m wrong, but I think that’s against the law in every country in the world. Daily Bell: Do you believe criminal acts have been committed within the frame of reference of what you discovered? Jesse Ventura: Absolutely, without a doubt. Many criminal acts have taken place. We break the book down into sections. Part 1 is Post War History; Part 2 is Government, Military and Corporate Secrets; Part 3 is Shady White Houses; Part 4 is 9/11; Part 5 is The War on Terror. Daily Bell: How can regular Americans stop criminal behavior at the top levels of government and in the media? Jesse Ventura: My belief is very simple and clear. All the people of the United States have to do is stop electing Democrats and Republicans. Vote for anyone else, because clearly, both of these parties, are bought off by the corporations. There is no doubt in my mind about it. I refer to the United States as the Fascist States of America now. If you look at the definition of fascism, it’s when corporations and religion control the government and that’s where we are. Daily Bell: What is the CIA’s top-secret program to control human behavior? Jesse Ventura: They have been doing it for years. They started back in the 60s doing many things to control people. In our book we describe how they use the military for experiments. In the late 40s, the US went down to Nicaragua and infected a massive amount of people with syphilis because they needed to see if penicillin worked. Fortunately it did. I mean, these people didn’t volunteer and that’s part of the reason I kept thinking of Nazis when I was doing this book, because that’s the type of behavior you’d expect from Nazis. Daily Bell: Here is information we received your publisher about your book. Feel free to comment on these … What was Operation Northwood and why does it matter? Jesse Ventura: Operation Northwood was discussed under John .F. Kennedy’s watch. It matters because of what it is. The Chief of Staff of the Pentagon suggested to the president that the CIA and the military attack certain US cities and make it look like Cuba did it. Then the country would support an invasion of Cuba. My question: If this was on the table in the 60s, was it not on the table in 2001? Could it parallel the twin towers? Could the twin-towers have been what they call a False Flag Operation? There have been many False Flag Operations. It seems that every war has been started this way. I am a Vietnam Vet, and the False Flag Operation of Vietnam was the Gulf of Tonkin. That’s what pulled us into Vietnam with ground troops, because we were told that the Vietnamese had attacked one of our ships in the Gulf of Tonkin. Well, I was teaching at Harvard in 2004, when McNamara was getting ready to die and he figured he better come clean. He admitted that the Gulf of Tonkin incident had never happened. Some 58,000 of my generation were killed and well over a million Vietnamese were killed, all based on an event that didn’t happen. Likewise the Reichstag Fire in Germany in the 1930s. They burned down the congressional building and blamed it on the Communists, which set the stage for war. It turned out that the Nazi’s had done it themselves. So many of these things are repeated over and over in history. It’s the old cliché, if it works once, it will work again. Daily Bell: What potentially deadly healthcare outbreaks have been covered up? Jesse Ventura: Many. There are biological experiments that have been done at Plum Island, which is right off Long Island. Eric Traub ran that operation, and his expertise was biological warfare with wood ticks and mosquitoes. Ironically, right across the water is a place called Lyme, Connecticut. And Lyme, Connecticut was where the first case of Lyme disease was reported, and as we know Lyme disease is passed by wood ticks. So was that an experiment that went awry at Plum Island, and now it’s loose, and we have to deal with it? That’s just one example of the US government dealing in biological warfare. Daily Bell: What does the Department of Defense knows about our food supply—but won’t tell? Jesse Ventura: There are a lot of chemicals being put in food today. And then there’s the water. Why do they put fluoride in the water? They tell us it’s to help our teeth, but we can’t look after our own teeth? Fluoride is the main ingredient for Prozac. So if you are drinking water with fluoride in it you, are drinking Prozac, and we all know what Prozac does. That is another little trick from the Nazis. They used fluoride way back. Daily Bell: Any non-public domain documents? 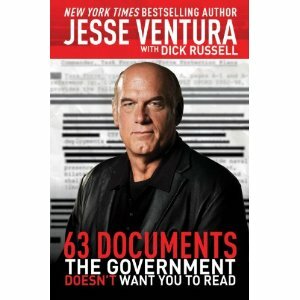 Jesse Ventura: Every document that we have used is in this book is in the public domain. All 63 documents are in the public domain; you just have to know how to search for them and find them. They are all out there in the public domain so I don’t have to fear being arrested. Daily Bell: Any other documents in the book you want to tell us about? Jesse Ventura: OK, let’s go to 9/11 for a moment, because we cover that in the book. An interesting document on 9/11 is the Pentagon’s stand down order. I always wondered why we didn’t have jet fighter planes in the air that day. Lo and behold, June 1 of 2001 by executive order of the President, George W. Bush, standard operating procedures were changed, when dealing with hijacked planes. Up until that point in time, it was left up to base commanders to make the call. If the FAA called them and said they had a problem in the air, the base commander would make the call to scramble the jets. June 1, 2001 there was an executive order changed that. The order from George Bush meant that no jets could be scrambled without approval from the DOD, which is the Department of Defense. Essentially you could have a stand down simply by Donald Rumsfeld not answering the phone, because nobody then would have the ability to go air-borne. Since then, it’s been changed back. Daily Bell: Is government generally too secretive? That’s the problem. Our government is concealing so many documents from the public that no one knows what is going on. As a citizen, I have every right to know what my tax paying money is going for. They don’t have a right to keep that secret from me. They are using my money; they are using the public’s money to finance this stuff, so we have a right to know. Now certainly, I understand from time to time the government may do some things that have to be secret; sure I do; I am a former Navy Seal. But when it’s over, there is no reason that the documents should not be made public. This is supposed to be the job of the mainstream media. When my country was formed there were three branches of government and the fourth branch was considered the media. They were supposed to be the watchdog of the other three. The media has been bought out by the corporate world and is now just the rubber stamp of the government. They are not doing their job. Daily Bell: Are government secrecy laws necessary? Why is government so secretive? Jesse Ventura: I don’t know. At times, as I said, it may be necessary but to the tune of 16 million documents a year? Ridiculous. Daily Bell: Has the US government changed in the past 25 years? Has it become more authoritarian? How? Jesse Ventura: Absolutely, without a doubt. Look at the Patriot Act. What puzzles me is that our forefathers set it up so that you have to jump through a lot of hoops to change the Constitution or amend it. They set it up that way so a president and congress simply can’t pass a law that supersedes the Bill of Rights. Yet look at the Patriot Act. The first amendment is about freedom of speech, freedom of the press and the right to assemble. But the Patriot Act says that the government is free to monitor religious and political institutions without any suspicion of criminal activity. The government can also prosecute librarians or any keepers of any other records, including journalists related to criminal investigations. You go to the 4th Amendment, which speaks to our right to be secure against unreasonable searches and seizures, The Patriot Act says the government can search and seize Americans without probable cause. Why are we letting them get away with this? They passed a law that superseded the Constitution and the Bill of Rights. Daily Bell: Do you trust the American government? Jesse Ventura: I don’t trust any government, not just the United States government. And I think that’s patriotic. Thomas Jefferson said, dissention is the greatest form of patriotism. I personally believe it’s every citizen’s civil duty to pay attention to what their government does, to question their government and hold these people’s feet to the fire. If you don’t do that, you will get bad government. Let’s remember something: Government is made up of nothing more than people, and people are not perfect. So it’s up to us as citizens to be diligent. Daily Bell: Do you think government is paranoid? Jesse Ventura: I don’t think the government is paranoid; they just have to pay homage to corporations. So, whatever corporations are doing throughout the world dictates what the government is going to do. Take for example, Hugo Chavez down in Venezuela; why does the United States hate Hugo Chavez so bad? He nationalized oil and kicked out Exxon. Another example, China is communist; Cuba is communist. We love China, and we do nothing but business with China. Yet we can’t do anything with Cuba. The key is the fact that Castro kicked out corporations, while China welcomes them. As long as you respect international corporate power, you will not incur the wrath of the United States. Daily Bell: Why hasn’t bin Laden ever been charged with anything regarding 9/11? Jesse Ventura: Exactly. I ask the same question. We’re a country that has a rule of law. They’ve had nine years to feed a grand jury and indict him and hunt him down. How do you hunt someone down, to either arrest him or kill him without indicting him first? The point is, I don’t think they have the evidence. Let’s remember an indictment does not mean a conviction. You are still innocent until proven guilty. An indictment is to get it to trial. So this has not been done, and that tells me clearly that they don’t have enough evidence to indict bin Laden. I’ll take it a step further, and this isn’t in the book. If you go to the FBI website, pull up International Terrorists, when you get there, you will find Bin Laden. It covers his attack on the USS Cole, covers his attack on the US Embassy in Africa but not one word about 9/11. The biggest single terrorist attack of all time and no bin Laden. The FBI won’t say it publicly, but off the record they have made statements that they don’t have enough evidence. That’s how come it’s not in his resume. Excuse me, we’ve gone through two wars and gotten the Patriot Act over something we don’t have enough evidence for. Not good. Daily Bell: What do you think happened on 9/11? Top people on the 9/11 Commission say that people lied to them. Jesse Ventura: I think the 9/11 Commission was a farce anyway. They weren’t even going to investigate 9/11, until the survivors from the families of the dead people raised such hell that they finally agreed to it. Always follow the money. Whitewater, remember that one? Where they investigated the Clinton’s real estate transactions, and ultimately found out the president cheated on his wife. Right? Well they spent US$100 million dollars to learn that! Now, here’s 9/11 where you have the murder of over 3,000 people. You know what the initial allocation of money was to investigate it? $4 million. They didn’t really want to do an investigation. The money speaks volumes. Daily Bell: Would you run for office again? Jesse Ventura: I don’t know. I have no intention to right now, but after 59 years I have learned never, to say never. Maybe I would get motivated to do it. If I did there is only one office I would run for, and that would either be vice president or president, but I have no intention to do that now. Daily Bell: Are warrantless wiretaps morally legal? Should they be used in America? Jesse Ventura: Absolutely not. They are not needed. You can go get a warrant if you have credible evidence that one is needed. Daily Bell: Is Congress intimidated by America’s Intelligence-industrial complex? Jesse Ventura: I don’t know, you would have to ask Congress. I do believe the CIA has run rampant for years now. They’ve been a rogue element and basically do what ever they want to do. Daily Bell: Why does America get into so many wars? Jesse Ventura: It’s ridiculous. It used to be that the rest of the world looked at the United States and saw hope. Today they look at the United States with fear, because if you cross the United States, there’s no telling what they will do. We might invade you; we’ll overthrow your government and occupy you. George Bush destroyed my American dream. I never believed I would see my country, without being invited, overthrow another country as we did Iraq. I also never believed I would see the United States commit perjury. I’ve been water-boarded, and I know what water boarding is. It is torture. Once you give up that high ground, how can you look at any other country and expect them to do anything you would ask them to do. Daily Bell: What is HAARP and why is it so important? Jesse Ventura: HAARP is big in Alaska. It’s 50 radio antennas and they shoot up 50,000 watts of power, which is the equivalent of what they allow for a radio station. It’s run by five or six diesel engines the size of locomotives, and it sends low-level radio frequencies up to the ionosphere, which is the top level before space, and throws them back to earth. They claim it’s to communicate with submarines under the water but they lied initially about it, because they called it an unclassified research center. When I went up there, they wouldn’t let me in, so that tells you right there they are lying because it’s not open to the public. If it were unclassified, somebody would be happy to let me in. One of the initial stories behind it is intriguing. Remember the tsunami that hit Indonesia a couple of years ago? That tsunami happened, but there was no earthquake and there was nothing that should have caused that, and yet witnesses on the ground said they saw northern lights before the tsunami came. Well, you can’t see the northern lights from Indonesia. But when HAARP is ramped up, it looks like the northern lights when they are using it. They aren’t going to go, “Oops, I guess we screwed up.” No, they’re not going to say anything about it, if they caused it. Allegedly China is experimenting with it also. There is an international treaty that says you are not supposed to create any weapons that can control the weather. You know what the loophole is? Nothing says you can’t do it domestically, so you don’t violate the international treaty. Daily Bell: Does the government have too much money? Should the Federal Reserve, which prints money from nothing, be abolished? Jesse Ventura: Hey wait a minute, the government has no money. It’s all the Federal Reserve’s money. None of that money belongs to the government. It all comes from the Federal Reserve and their name is on it. We have to get that straight right away. Absolutely the Federal Reserve should be abolished, in my opinion. It was created illegally to begin with, because the Constitution said they couldn’t do that and then in 1913 they just amended the Constitution and did it anyway. If you want to amend the Constitution, you have to have approval of two thirds of the states, on a vote. They never did that so the Federal Reserve is illegal. Daily Bell: Is there such a thing as money power? What it is? Jesse Ventura: Absolutely, he who has the money has the power. That’s why I will tell you that the Federal Reserve probably runs the United States of America because they have the money and the power. The money equates to power. Daily Bell: Does an Anglo-American monetary elite – a few powerful banking families – want to create a New World Order? Jesse Ventura: I don’t know. Maybe when you look at a world government, maybe it’s inevitable. Maybe it’s an evolution, because the world gets smaller every day, and I ‘m not saying that’s good or whatever. The world has gotten much smaller with technology and computers and ultimately maybe in 100 years from now, there will be only be one world government across the earth. I don’t know. One thing that you would hope would happen is in such a situation, there wouldn’t be anymore wars. That might be one positive thing that would grow out of it. But I don’t think I necessarily support that. You know, they are trying to create it by using global warming. The global warming cap-and-trade means you will now be paying an international tax. When they start collecting all this money, guess what, it grows. Anything that gives money to taxation grows. Global warming is definitely a technique for creating global government. Daily Bell: Let’s step back a little. Please tell us a little about your background, where you grew up. You entered the armed forces, and you were a professional wrestler. Give us your story. Jesse Ventura: I graduated from Minneapolis Roosevelt High School in South Minneapolis. I was the swimming captain, and I played on an undefeated football team, a typical high school jock. I joined the Navy right out of high school and being a swimmer, I immediately volunteered for the underwater demolition seal program. I graduated from the Seal training program and served three years with Underwater Demolition Team 12, then served another two years. After I left the Navy, I began my pro-wrestling career for 15 years. Then I was successful running for political office and became Mayor of Brooklyn Park, Minnesota, which was the 6th largest city from 90-94. I went back to the private sector and did talk radio till 1998. Then I ran for Governor of Minnesota in 98, and was successful again, both times as an independent, I might add. The key to my run for Governor was this, something they never want to talk about. I only raised $300,000 to do it. The Democrats and the Republicans combined, spent 12 million on that campaign, and yet I beat them. I beat them with ideas rather than money. When I finished being a Governor, I became a professor at Harvard University, I’m a fellowship professor at the John F. Kennedy School of Government, and it was at that point I went on an adventure by moving to Mexico, 900 miles down the Baja, where I currently live half the year. I live an hour from pavement and an hour from electricity. My house is completely solar down there. I am off the grid. I have no television, nothing like that. When I go down there, I call it flushing my brain out. I took up surfing and am trying to conquer surfing as best I can. Daily Bell: Are you a libertarian? Jesse Ventura: I classify myself as libertarian small L. The capital L libertarian is an anarchist. I am very much libertarian, but I understand there is a world for government. But it’s not the world that it’s blossomed into today. Daily Bell: We believe the best government the one that governs least? What do you think? Jesse Ventura: Absolutely. I am fiscally conservative and socially liberal. That’s why I can’t fit in either camp. I don’t care if gay people get married, I don’t care if gay people join the military, I am very liberal on all social issues, I am pro-choice, but on the flip side, government wise, I am fiscally conservative. I think that government is in far too many places, and it takes far too much money. I support abolishing income tax and going to a national sales tax, which would mean we would only have to pay 15% on the dollar. Right now with income tax, you can go to 30, 35 or 40% on the dollar. Daily Bell: Are you afraid for your life or the life of your family because you are writing on such controversial subjects? Daily Bell: What is next up for you? Jesse Ventura: I will finish my book tour and then go back down to Mexico, and finish my last month and a half down there, and I will see what happens. I don’t know. I will come back to the States. If my TV show gets picked up again, I will do that. Who knows what I’ll do? I could also disappear. I will turn 60 this summer, so who knows? I never had a plan for my life anyway. But I will say that as of Friday, Jesse Ventura started his first official website. I have never owned a cell phone and I don’t have a computer. My son is running my website now, and it’s called, weaintgottimetobleed.com. Daily Bell: Some closing thoughts? Jesse Ventura: Get involved! Quit being lemmings. When you live in a democracy, it requires the population to be involved. If you don’t hold elected people’s feet to the fire, you will get bad government. And that is what we’ve got to conquer here. The people who are not paying attention, people who are not caring. You can’t be that way. You have to care and you have to keep government controlled. Daily Bell: Thank your time. You are a most courageous man, and we hope everybody reads your book. Jesse Ventura: Well thank you, and I hope everybody does too because its important book to read. People will be shocked when they read what’s there. People in the United States seem to think their government can’t be evil. Then on the flip side, there are a lot of great, honest, hard working people in government that work for the public good but it doesn’t mean there isn’t elements of evil in the United States government. It’s our job to root out that evil. What is most interesting about Jesse Ventura is the type of person he is. He is an original thinker and yet his background would not lead one to believe he would have become one. He is a challenger of corrupt authority, yet throughout his life he has been involved in a system of authority and profited from it. We think that he must scare the powers-that-be because he is a walking example of how one can be entirely acculturated within a social environment and still end up questioning it. The Western system is positioned to point people in a certain direction and to deprive them of money and the time to think for themselves. Given the way the system has been set up, Jesse Ventura should not exist. He should have long ago accepted the certainties of Western power and ceased to question its authorities. He began, in fact, in the US military and presumably accepted a certain outlook as a result. He then became a well known pro-wrestler, an environment that is not known to be especially conducive to introspection and free-market thinking. Some – a few – have emerged as entertainers and movie stars from pro-wrestling, yet Jesse Ventura moved from pro wrestling into politics. He became a mayor and then Governor of Minnesota, and an independent one at that, beholden to neither mainstream party. We read somewhere that after Ventura became governor, he was called to Washington where he met with the CIA. He took questions from a number of agents and wrote that eventually he figured out what they wanted to know. They were investigating how he’d managed to become governor on an independent ticket! What scared the powers-that-be, apparently, was that anyone could achieve outside the two-party system. Yes, generally, Jesse Ventura is a scary person to the current system. Ventura has no business being where he is today. His military background could have switched off the part of his brain that asks too many questions. His experience as a pro-wrestler might have focused him on show-business and the ephemera of achieving in the venue of public entertainment. But instead, Ventura went into politics, where the system itself should have disciplined him and focused him on achievement within certain social and cultural parameters. Yet somehow Ventura emerged from this experience and continued to wonder about the world around him. It is obvious that Jesse Ventura cannot help himself. He sees unfairness and wants to rectify it; he sees the growth in government power abuses and wants to prune it back; he sees the dangers of growing authoritarianism and government centralization and stands athwart the track shouting “stop.” He has no reason to act the way he does, to ask the questions he does, to take on the battle of opposing increasingly questionable abuses of government authority throughout the West. Given his background, he should be PART of the authoritarian paradigm, not questioning it. And yet here is, a walking, talking refutation of the way the system should work. It is meant to winnow out the Venturas and either co-opt them or defeat them. Jesse Ventura is an example of why the current bout of authoritarianism can go so far and perhaps no further. It must be intensely frustrating for those who have set up and implemented the current system, which is designed primarily, it seems, to make people obedient. People like him shouldn’t exist in the Modern Age of the West. It is a mystery of the human spirit. But we are certainly thankful that there is a Jesse Ventura and that he, too, desires to spread freedom and free-market thinking. Editor’s Note: A few days ago, on April 7th, Russia Today’s Anastasia Churkina sat down with Jesse Ventura for an exclusive interview about his latest book, “63 Documents the Government Doesn’t Want you to Read.” To visit the Daily Bell YouTube Channel and watch the Ventura interview, click here now.